WHICH WILL IT BE--A PUBLIC PARK, OR MORE PRIVATE-PROFIT TOWNHOUSES? MAY VERY WELL DEPEND ON WHAT YOU DO TODAY. BETWEEN THIS . . .
. . . AND THESE. According to information received from Protectors of Pine Oak Woods, Staten Island's land conservation organization, the city's Uniform Land Use Review Procedure, or ULURP, has already begun. ULURP would authorize the New York City Department of Parks and Recreation to purchase a 38-acre parcel within Goodhue Center, a New Brighton facility owned and operated by the Children's Aid Society. Located within a site bounded roughly by Prospect, Lafayette and Brighton avenues, Goodhue Woods is the last large tract of undeveloped land on Staten Island's north shore. The Parks Department purchase offers the community an opportunity, in concert with our political leaders, to chart a different course from the one the developers prefer. And that is to acquire Goodhue Woods for public use as a public park. This purchase also carries forward, its essence unchanged, the vision of the property's last private owner, Sara Goodhue, who in 1918 donated the land for the community's greater good. You don't have to follow every suggestion below. But please, pick one (or more) and follow through. Let's make this happen. Attend a hearing and express your support. --Parks Department presentation and public hearing, Staten Island Community Board 1 Land Use Committee, June 1, 8 p.m., at the board offices, One Edgewater Plaza, Clifton, Suite 217. Information: 718-981-6900. --Community Board 1 will vote on the Parks Department's proposed purchase at its Tuesday, June 9 meeting at All Saints Church, 2329 Victory Boulevard, Willowbrook. Please attend the public contact session, which begins at 7:30 p.m. Information: 718-981-6900. A walkable New York City neighborhood located 1/2 hour from downtown Manhattan can support greater density. What kind of density, in what form, and where, are all valid questions, but out of the question for the purposes of this post. My point here is straightforward: with more people come more of everything. Including more offbeat, crazy or eccentric events, experiences, and people. That's why I live in a city. The city. Good thing my neighbor and friend Marc Zimetbaum had his digital camera at the ready when he spied this Clown-in-a-Car, sitting in the driver's seat on St. Marks Place in St. George, outside the Curtis High School gate. Turns out he was just killing time prior to a scheduled appearance at a children's birthday party across the street at Castleton Park apartments. The unidentified man put on a particularly winning smile for Marc's camera. A few days later, my friend Steve Nutt, a potter and fiber artist from Ward Hill, was riding his bike through St. George. He was proceeding northwest on St. Marks, approaching Hamilton Avenue--about a half block from the location where my friend Marc spotted the Clown-in-a-Car just a few days before. 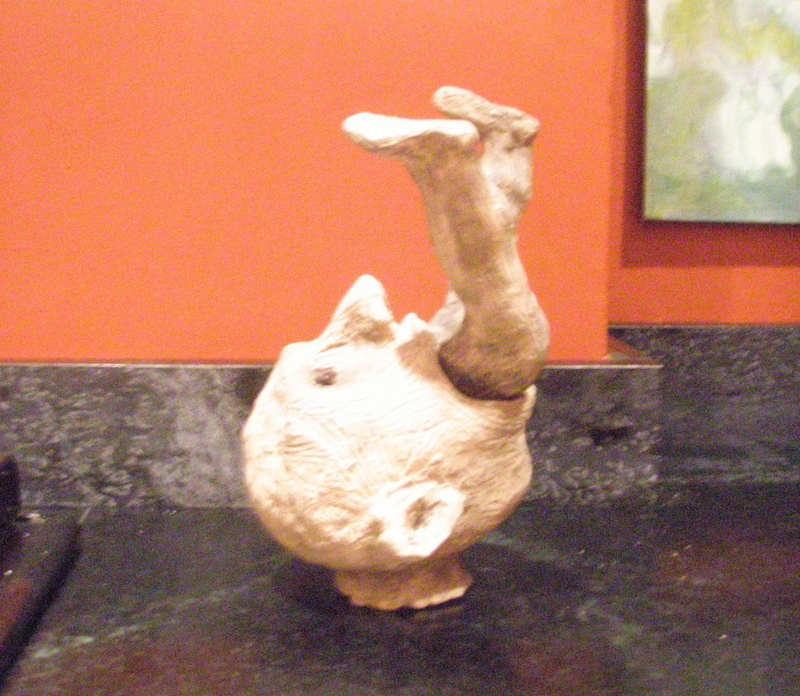 As Steve approached the corner, he saw the conical object at right out of the corner of his eye. Luckily for me, he had brought his camera along, just in case. Thanks, Steve and Marc, for documenting two of the loonier aspects of two representative days in the life of St. George, which would not have been complete without clown and tepee. 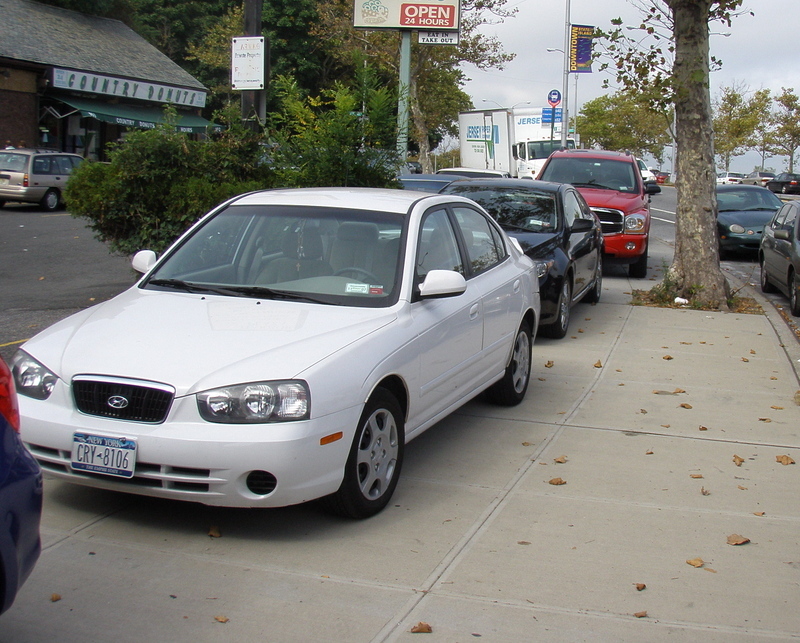 It's been two weeks since September 20, when I observed several cars parked on the sidewalk in front of a strip mall occupied by a municipal agency and a not-for-profit on Richmond Terrace between Stuyvesant Place and Hamilton Avenue in St. George, Staten Island. I took pictures of the offending vehicles and promptly posted them here. 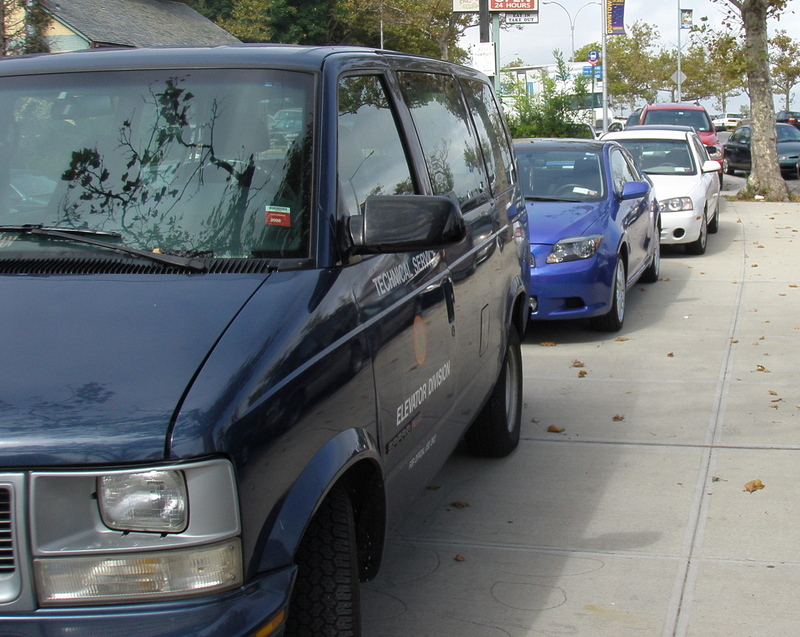 When I returned to that location today, I discovered even more cars parked on the sidewalk, including a dark-colored SUV parked so close to the curb, it forced pedestrians into the street to get around it. 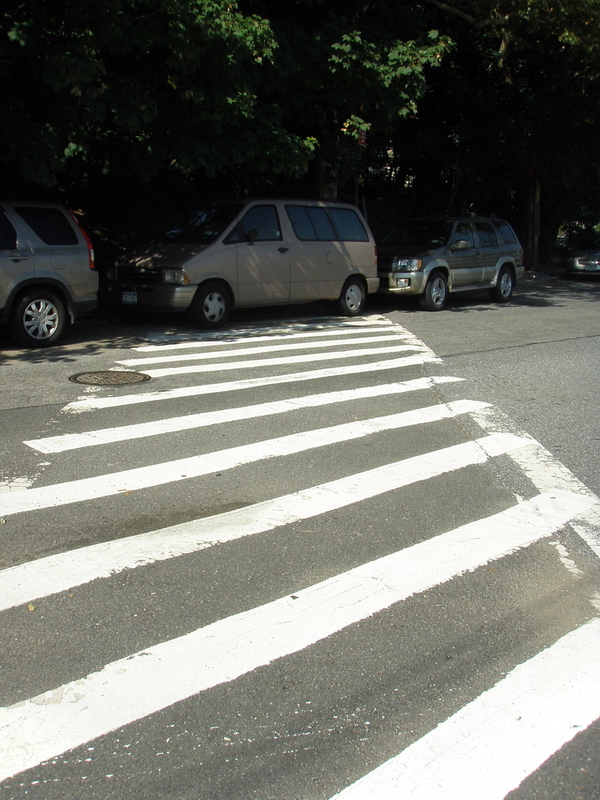 Around the corner, on Hamilton Avenue between Richmond Terrace and Stuyvesant Place, there were three cars parked half on the sidewalk, half in the street, all right near a clearly visible "No Parking Anytime" sign. This location is only one block away from, and on the same side of Richmond Terrace as, the 120th Precinct, NYPD. How is it these violators are allowed to remain unticketed and unchallenged, day after day? 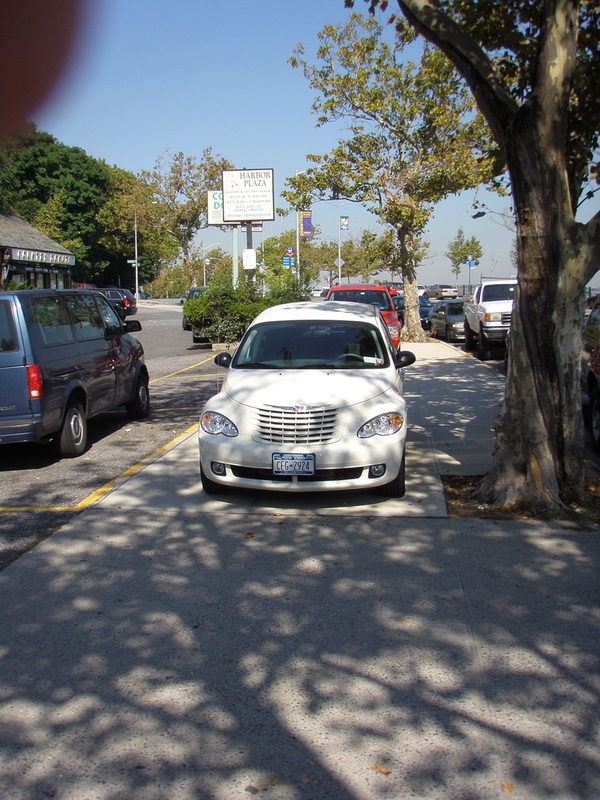 What's more, this location is only two blocks from the ferry terminal, the borough's multi-modal transportation center, where the ferry docks and where the MTA-operated Staten Island Railway and most MTA-operated bus lines begin and end . 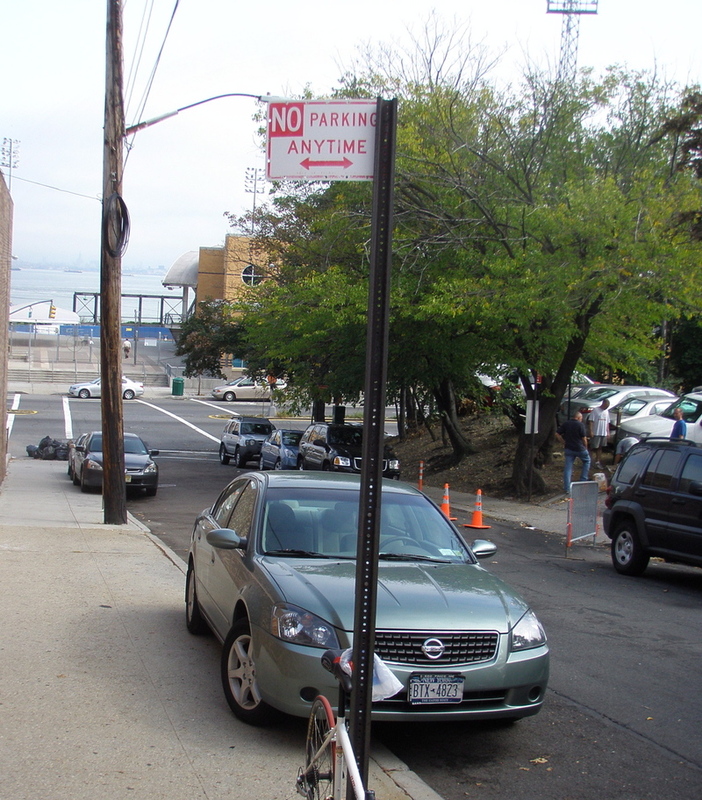 Why--considering all the negatives associated with private transportation--are so many people still bringing their cars into St. George, probably the most densely developed and populated neighborhood on Staten Island, and the best served by mass transit? It looks like it's time to spread the word--and the pictures.